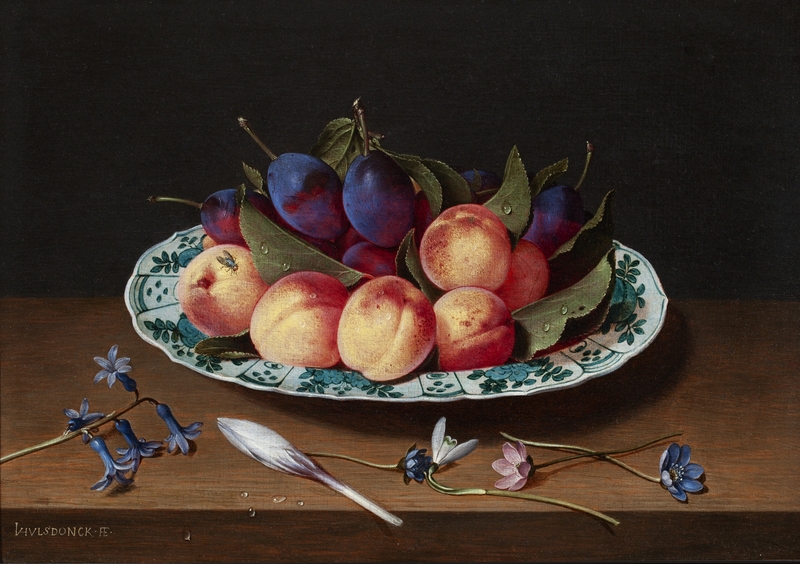 acob van Hulsdonck was a Flemish painter who played a role in the early development of the genre of still lifes of fruit, banquets and flowers. 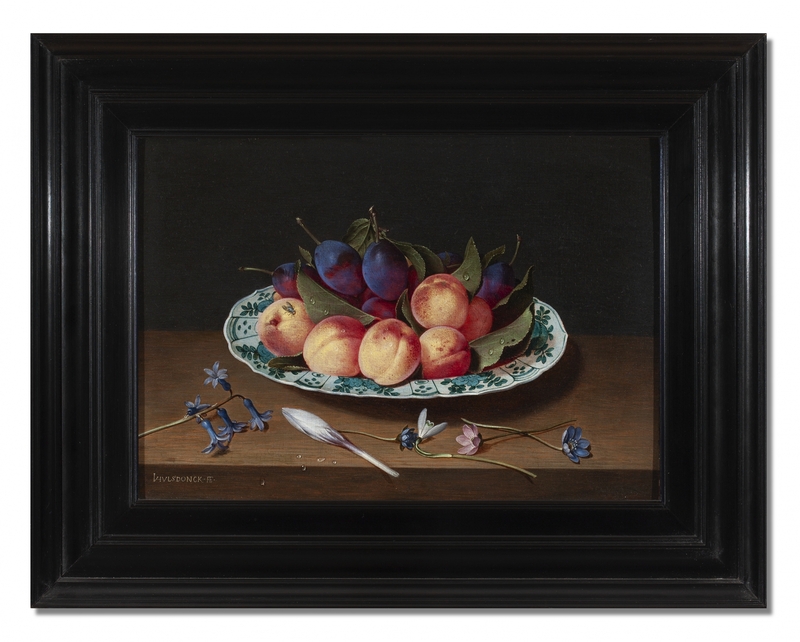 This fully signed painting by the Flemish master shows Hulsdonck’s specialty since his oeuvre consists mainly of fruit still lifes. Van Hulsdonck was particularly skilled in rendering the softness and delicacy of the skins of the fruit. He was a master in bringing out the difference of texture and colouring of the various types of fruit and their foliage. Jacob van Hulsdonck was born in Antwerp in 1582, but grew up in Middelburg. 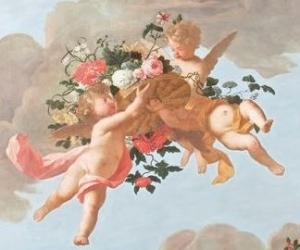 Here he was probably influenced by Ambrosius Bosschaert. In 1608 he was registered as a master-painter in the Antwerp Guild. Although he must have been familiar with the work of the Bosschaert studio, his work shows more affinity with the work of Osias Beert and even Hieronymous Francken II, two still life artists active in early 17th century Antwerp. It is even possible that van Hulsdonck worked in their circle before becoming a master in the Guild of Saint Luke. Roughly 100 paintings are currently attributed to him. The meticulous handling of detail in his work likely explains his relatively low output. More than half of his paintings are signed with his characteristic full signature in capitals while some are signed with a monogram only. Because he only left one dated work, the Breakfast piece with a fish, ham and cherries of 1614 (Bowes Museum, Barnard Castle) it is difficult to establish a chronology of his works. It is believed that his earliest still lifes are the ones in which the edge of the table is close to the bottom of the picture and the table is depicted from a rather elevated viewpoint. In these early works, the table is partly covered with a white cloth. In his later works he abandoned some of the rigidity of these early works by lowering the viewpoint, leaving some space under the table and including one side of the table in the composition.